Feeling a bit more self-loathing than usual? Then do this (gpx) (38mi, 8200′) to yourself, preferably on rainy day in the low 40’s with about a half-mile of visibility. If the endorphins don’t help, at least you’ll have lots of time on the endless uphill grinds to think about what ails you. 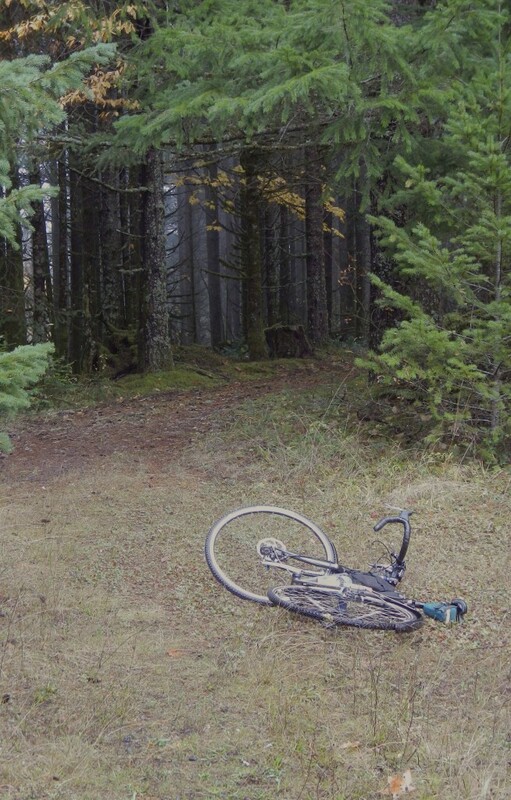 The Logging Road Cyclist eschews the latter: He takes an iPod. The ride is the same as Richard Simmons for the first 12 miles, to the top of Dimple Hill, after which it gratuitously descends Dan’s Trail, forcing a return up the ridge to Lewisburg Saddle. The route follows Patterson Road to it’s northern end, whence it drops down to Soap Cr. Rd, which it follows to Tampico Road. A couple of miles W on Tampico leads to Forest Peak Ridge Road (Road 300) which climbs into Dunn Forest. 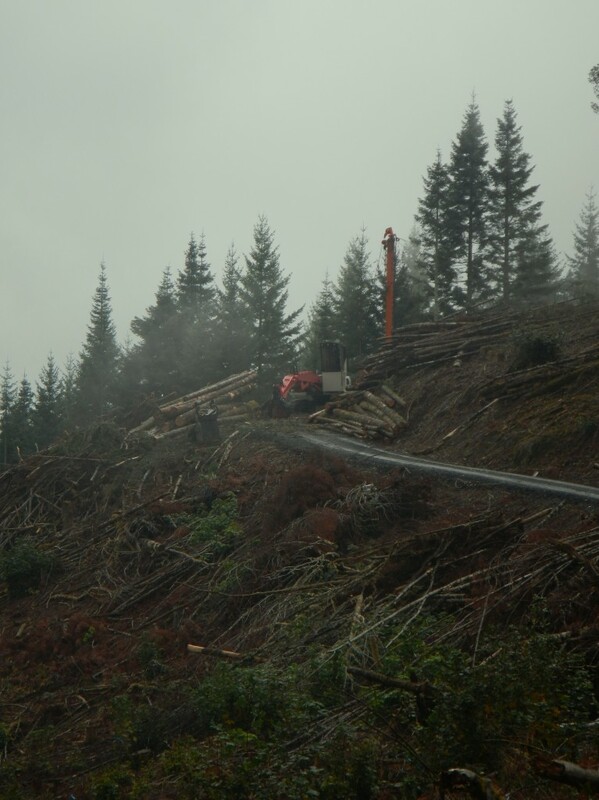 Dunn Forest is the more intensively managed of the two OSU Forests, so you can expect bigger and newer clear cuts as well as active logging operations. Lest we forget the “L” in “TLRC”: OSU logging operation on Road 300, Dunn Forest. Looking north from the 300 Road. 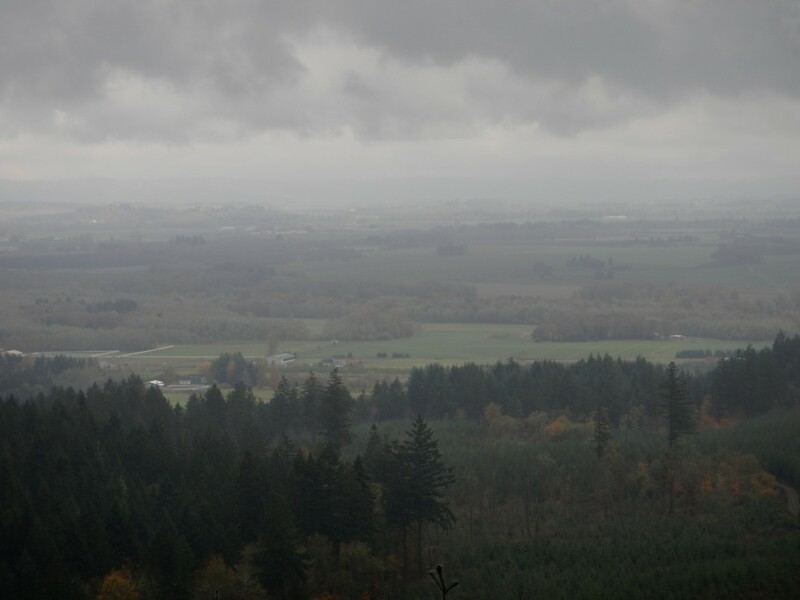 This pastoral scene hides the National Guard rifle range ( just off the upper left of the picture), a remnant of the small arms, artillery and armor ranges that were located on this plain as part of Camp Adair, the WWII training facility that lies along Hwy 99 just east of here. The view from Forest Peak. The little out-and-back on the GPS track from here is just TLRC trying to force his way down a road that used to provide access down to Maxfield Cr. It is now completely overgrown with some awful invasive, so don’t bother. Rather, backtrack to the Starker gate, go down the hill, and just before the road drops to the left along a huge new clearcut take the vague trail right (it gets less vague very soon) and down into Maxfield Cr. There follows the steep climb out of Maxfield, a traverse around the top of Price Cr. and the final climb back to McCulloch. Whew! Feel better? TLRC did, since it was over….